What does it take and where do you do it? 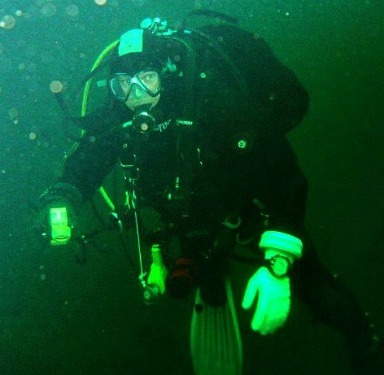 Cold water scuba diving is done in the temperate water's off of Canada's West Coast, also known as the Pacific Northwest. Specifically I am referring to the waters surrounding Vancouver Island. Using a special kind of suit called a "Dry suit", you literally stay dry inside the suit, which utilizes a layer of insulation combined with "air"
This suit serves to keep you warm in the frigid water. Vancouver Island, BC has these temperate seas where the water is usually between 44 and 48 degrees F or (6 -9 C) and offers some of the best scuba diving anywhere in the whole world. One simply needs to learn to use a dry suit, (which requires training that anyone can do) and some extra gear for safety, as well piece of mind. The scuba diving in the cold water here is awesome as many reviews will attest. If you love scuba diving, or think you might, then read on. The number one difference in cold water scuba diving in the Pacific Northwest, is the suit that is "recommended" you wear! I say this because some people still insist on wearing a wet suit. The specialty "Dry suit" comes in several different designs/styles and any colour imaginable. So is one suit better than the other? Probably the best answer is "just different". Suits are expensive, so one thing I highly recommend is do your research! I think the store (and manufacturer) that gives not only a good price, but the best service is the one that should get your money. Reputable dive shops will likely discount the price of a rental if you buy a dry suit from them! If they don't, that say's something! Dry suits can also have a feature where the suit has special cuffs on the sleeves that allow for dry hands. This way you can wear as a warm a glove as "you need". A bonus of the dry glove feature is that it allows for much better finger dexterity. The "air" along with the insulating garments is what helps to keep you warm, as well as serving the dual purpose of buoyancy control and keeping the squeeze of the water pressure off of your body. Apparently air is a great insulator, who knew! If you buy a used suit, it must fit reasonably well, and this next point may seem obvious, not leak. If you can't try it before you buy it, beware! To find out more about Used Scuba Equipment follow this link! Basically the training you take is for managing the air intake and exhaust of the dry suit, so as to skillfully manage your buoyancy as well as the squeeze of the water pressure on your body. The suit then has two valves, one to inflate, and one to exhaust! Suits that are to big make it almost impossible to manage the air bubble that will literally slosh around in your suit! A suit that is to big for you will just make for an uncomfortable, and evendangerous diving experience! This first item, I think is grossly under rated! It is a small air cylinder called a pony bottle, that has its own designated regulator and pressure gauge. In theory you can use your buddies octo, but I still like to have my own "extra" air source close by. Other recommended gear for cold water diving would include an inflatable Surface Marker Buoy or SMB for short, and a spool of string of 100ft or so. Got to have to have a good light, (or two) for a few reasons. They make great signaling devices, and its good to have a back up. Also in the greenish water of the Pacific Northwest you need a light to see the actual colours of what you are looking at, especially when you are deep enough to have lost the natural light. A good knife is always a wise addition! Though I have not yet had to use mine for any emergencies, it is more of a piece of mind item than anything, and a good habit to get into carrying. There are literally tons of discarded fishing line, down rigger cable, nets, ropes, and naturally occurring hazards like kelp. A compass, (that you know how to use) for night diving or for when the visibility is poor. Unlike the tropics "natural navigation" techniques are harder to use in the greenish waters of the Pacific, do to less distance visibility. A small coloured strobe (water activated) for night diving and easy identification if in a limited visibility situation. Hope you have enjoyed this page and come to appreciate cold water diving as much as we do!